This looks absolutely stunning. David, fantastic work! I really wish more developers would become interested in developing for KDevelop. 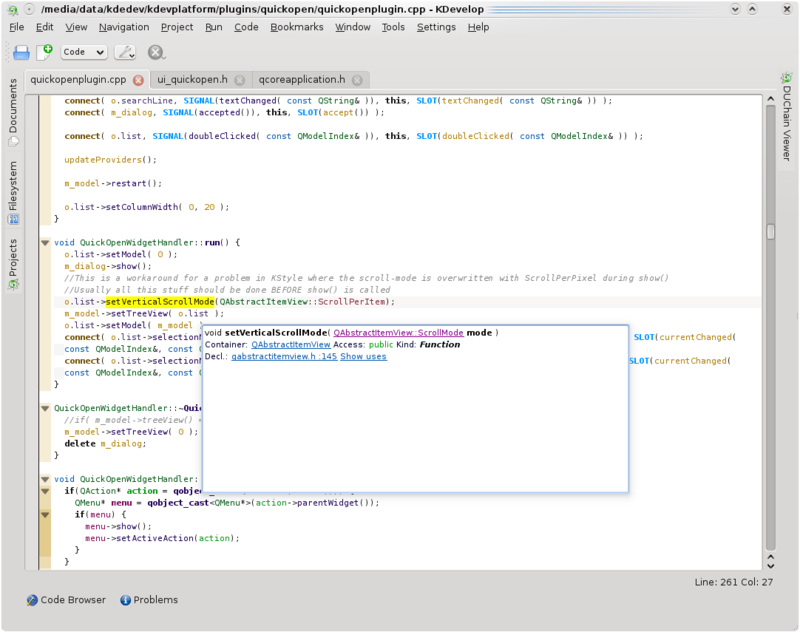 Hopefully things will pick up when KDevelop 4.0 is released and developers realise just how much easier, faster and more convenient it is to develop s/w with a good IDE as opposed to a good text editor (I speak from experience having migrated somewhat grudgingly from Vim to Eclipse for Java development). I use kdev4 almost daily now and its really hard to now code without it. 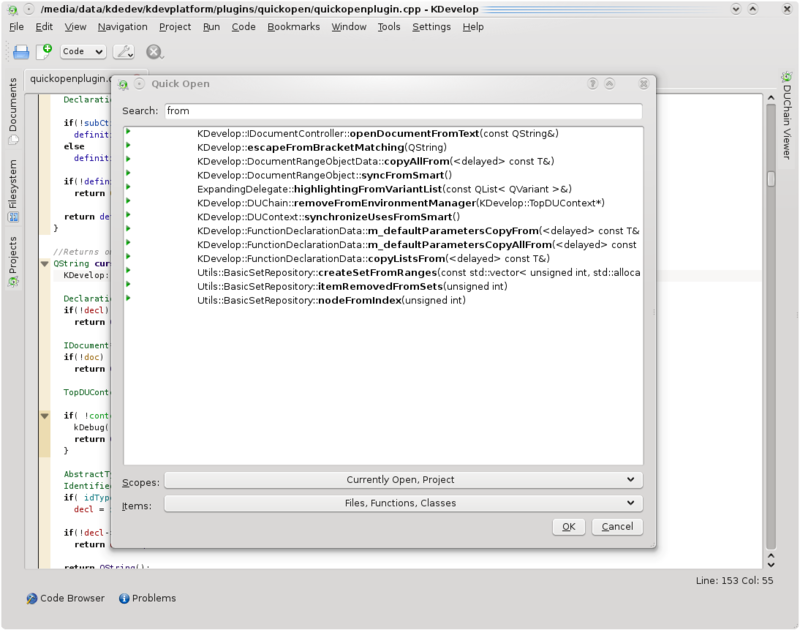 kdevelop knows more about my code than i do and code completion almost requires no configuration to get it working! Actually, i think that is “zero” configuration. 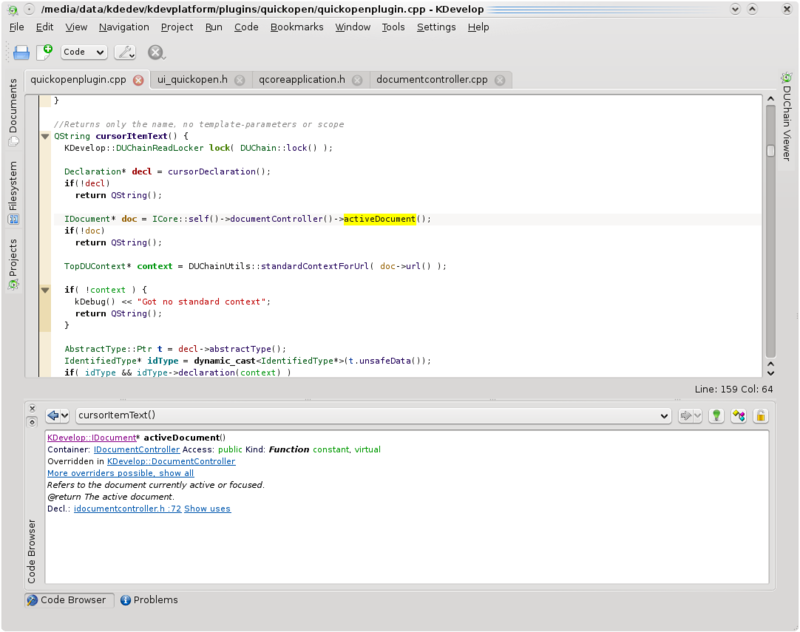 Other features can follow post the first 4.0 release but a debugger is a must i think. I use it for all my C / C++ school projects now, but it’s been crashing on me and I’m hopelessly out of free hacking time for the next two months or so … I use Kate for bulk editing and KDevelop for browsing and quickly grokking code. @Peterix: I don’t know what you’re meaning with that “ternary” stuff, but symbol lookup for sure isn’t the reason for the stuttering. 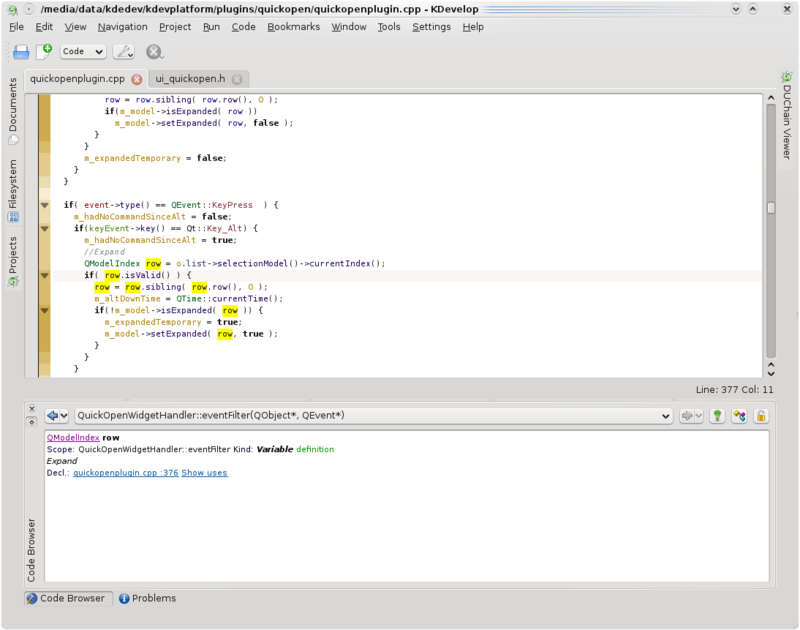 It’s more probably the editor, or some other component in the duchain that hits some scalability limit. This just needs some more profiling. About the crashes, you should a) update, because some crashes were fixed, and b) if you encounter crashes, send backtraces to us. – I’m typing some code in a file. @DanaKil: I think the default bookmark toggle button is CTRL+B, and I have assigned the buttons Meta+Up and Meta+Down to jump to the previous/next bookmark. I think this is enough to achieve what you want! You just push CTRL+B to set the bookmark, edit something else, jump back to the bookmark using the other shortcuts, and remove it again using CTRL+B. If you want it all automatic, you can use the navigation history. 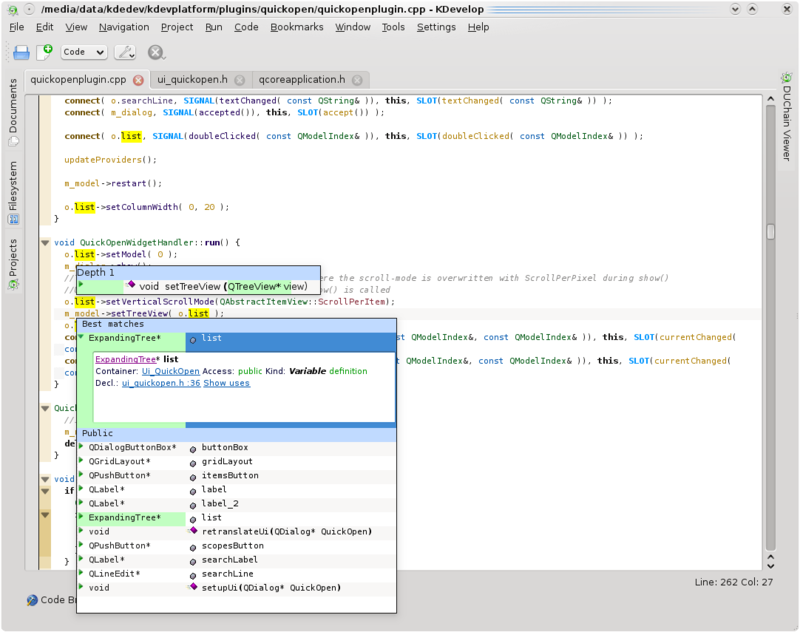 And really useful to have all documentation inside the editor! A quick comment about the quick open dialog. I think it would make sense to place the “Search”, “Scopes” and “Items” widgets all together, as they are all just ways of filtering the list. I’m not sure if it’d be better to place them all at the top or all at the bottom, but placing the results in the middle seems a bit awkward. @Parker Coates: It’s a question of priority. At the top you do the typing, and at the top you have the items in the list. That’s the important stuff, and it should stay together(nothing between these two). Those “scopes” and “items” usually are usually pre-set depending on the shortcut you use, and remembered from what you used before, and you will only seldomly change them. Thus they’re at the bottom, waiting for the rare occasion of being used. I mean, OK, maybe I’m just a curmudgeon, but having all this random tooltip crap pop up when I mouseover any semantic element in my code, quite frankly, just annoys me 😉 Semantic highlight already highjacked my colors and I had to slap it around, and now semantic popup-on-mouseover and highlight-all-instances are in completely the wrong color and obnoxious. @a: If you don’t like any of the features, then you’re simply using the wrong IDE.